Digital ads for the meat hoodie have won surprisingly wide attention as the makers of the hooded pullover carpet-bomb the cheapest corners of the internet in hopes of hitting a target. The biggest complaint about advertising today is that it is creepily precise. Ads seem to know where we shop, what we like and the exact color and size. Many live in a state of paranoia that our mobile devices are listening to us, surfacing ads for things we’ve merely discussed but never searched. Several times, I have been served ads for a hooded pullover sold by a low-priced Chinese clothing brand. Advertised as a Raw Meat Kangaroo Pocket Hoodie, the top is emblazoned from edge-to-edge with a print of marbled raw red meat. Think of it as the tuxedo T-shirt version of Lady Gaga’s infamous meat dress. It would be a bold look for anyone — let alone someone like me, whose sartorial choices have repeatedly led fellow J. Crew shoppers to mistake me for an employee. Colleagues said they were also trailed by the garish top online — including in a recent ad on the Los Angeles Times website next to coverage of the Camp fire. The ad has also been spotted on The Seattle Times website, Reddit, The New York Times’ opinion section and beside a story in the Federalist. 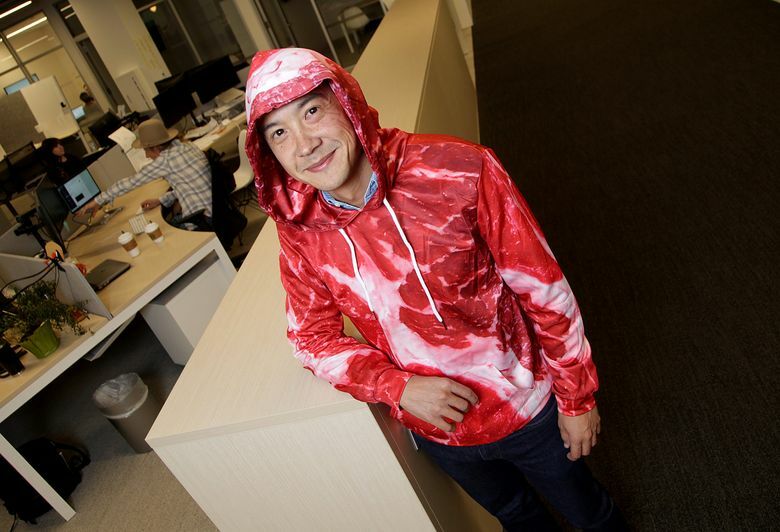 In the $80 billion digital advertising ecosystem, the meat hoodie is almost retrograde. Rather than relying on the breadth of personal information made available by services like Facebook to marketers willing to pay for it, the makers of the meat hoodie are carpet-bombing the cheapest corners of the internet in hopes of hitting a target. “An ad buyer can say, ‘I only want left-handed truck drivers in Oklahoma after midnight,’ ” said Oscar Garza, executive vice president of media activation for ad agency Essence. Search “meat hoodie” on Twitter and you’ll find streams of people scratching their heads and shaking a fist at the advertising algorithms of Google — a company that commands nearly 40 percent of the U.S. digital ad market. The maker of the meat hoodie isn’t necessarily choosing who sees its wares — or even which sites get to tout it. Those impressions (industry jargon for when someone sees the ad) are facilitated by an automated system. Programmatic ad-buying technology, which has been around for more than a decade, allows brands to spread their marketing across a slew of websites instead of having to negotiate deals with them one-by-one. Ad exchanges serve as a sort of middleman in the buying process. Once a brand decides how much it will pay for an impression, its ad competes with others vying for the same eyeballs in an online auction decided in milliseconds, Garza said. Low-cost ads can be purchased on Reddit, a hub of message boards that dubs itself the front page of the internet but is also home to controversial and sometimes strange content (like photos of trees that look like they’re swallowing their surroundings). So what says the company that actually makes the meat hoodie and other sartorial oddities like the hairy-chest hoodie? BuzzFeed found Globalegrow was using stolen images to market its threads and duping buyers by claiming to hold security certificates from reputable firms such as PayPal and Norton Security. The clothes they shipped often looked nothing like the ones advertised, the investigation found. Globalegrow’s emergence underscores the shrinking gap between Chinese factories and American consumers in the e-commerce era. Manufacturers in Shenzhen no longer need middlemen — fashion brands, brick-and-mortar stores or even Western e-commerce operations — when they can market their wares directly to U.S. audiences. It’s unclear if the mounting complaints by customers were ever addressed by the Chinese company, which claims on its website it reached $1.4 billion in revenue last year — less than one-tenth of Gap’s sales the same year, but no small number for a fast fashion brand. Ads for the meat hoodie were linked to two of Globalegrow’s brands, Rosegal and Gamiss. Seeking an interview, I emailed the company and explained how the meat-hoodie ads were attracting attention. I wanted to know what was behind the outrageous design. Two days later, I received a reply from Vanessa Liu, public-relations manager for Globalegrow.